You are here: Home » Rob's Blog » Come Join Us at the Heartland Nationals! Come Join Us at the Heartland Nationals! If you love muscle cars, hot weather, fireworks, and a state-fair like atmosphere be sure to come visit is at the Hearland Nationals in Des Moines, IA July 1, 2, and 3! For the first time ever The MuscleCar Place will have a booth at the show in the Varied Industries Building. Stop by and say hello! We’ll be doing podcast recording right from our booth, will have t-shirts for sale, and hope to snag as many rides through the autocross as we can. Click the picture below for the Heartland Nationals website. 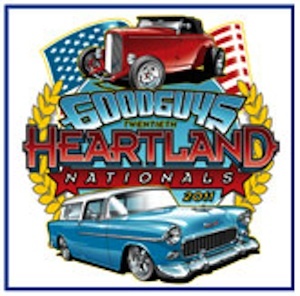 Every 4th of July the Good Guys Rod and Custom Association hosts the Heartland Nationals at the Iowa State Fairgrounds in Des Moines, IA. It’s kind of like a State Fair, but with cars and car gear instead of animals and agriculture gear (and yes, you can get a pork chop on a stick if you want one….which I do). The weather is usually really hot, the muscle cars are great, and since it’s over the 4th of July weekend it’s typically a very patriotic place to be (there are even fireworks at night). I love going to this show each year, and we’ll be there this year as well to meet as many people as possible. There are always a lot of muscle cars for sale, vendors with the latest and greatest parts, places to autocross (i.e. race) your muscle car, and just generally enjoy yourself .